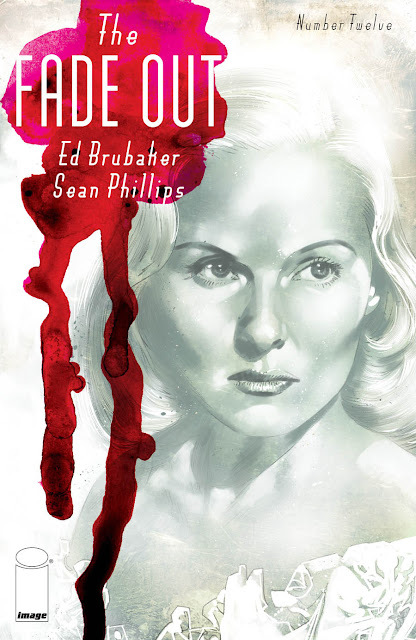 If you thought Ed Brubaker and Sean Phillips brilliant Hollywood murder tale, The Fade Out, was going to end in some kind of fairytale ending then you haven't been paying attention. In a world full of people pretending to be other people you never know who you can trust and Charlie learns that the hard way and despite his efforts becomes another cog in a corrupt unsympathetic machine. 'The Fade Out' #12 puts things into perspective as people disappear or die and the concern is not the who or the why but how can this freight train of a studio system can keep chugging along without disruption. After all, the only people really worried about solving the murder of Val Sommers are two writers who are unqualified, desperate and on the sauce. Charlie and Gil have no business shaking the trees looking for answers to questions no one but them are asking. Brubaker lays out the reveal of Val's murder in a matter-of-fact way that fills the gap of our curious mind but there's no solace in the truth.Val was just a stumbling block to be fixed to keep the status quo as much as possible. In the end, Charlie learns "girls die for nothin' and old men cry about it, and the business keeps on going." Some people still benefit in one way or another, receiving a consolation prize in the form of a better position or a new relationship, content to be rewarded even if it's not what they really wanted. Either way, many are better off then when 'The Fade Out' began. There's no happy ending because happiness isn't part of the equation for surviving in Hollywood. Resigning oneself to moving upward and off the floor is well enough. One of the treats for me as a Southern California native is seeing local cities represented especially the ones that don't exist anymore. Phillips is not just the brilliant artist but the co-writer in pictures. It's what makes Brubaker and Phillips such a potent combo. Every line of dialogue and every panel of art deliberately tells the story. Whether it's a single curse word or a look of anxiety, the story is unfolding before your eyes without a false beat or wasted moment. Elizabeth Breitweiser ties it all together in a tapestry of muted colors that seem almost sorrowful. Few have ever captured the look, the feel, and tone of a bygone Los Angeles like Phillips has. The crowded streets in front of Grauman's Chinese Theatre, the dilapidated fences and tall weeds of Chavez Ravine, the bright and hopeful entrance of a studio hiding the dark secrets that drive success but kill the soul. Phillips has done some of his best work once again. 'The Fade Out' ends in a sudden and blunt way it won't offer any satisfaction and warm fuzzy feelings. Especially because Charlie, drunk and a hot mess, cowers under the bright lights of Hollywood as if the town is laughing at him mocking him. Feeding him the truth without justice or resolution but keeping him alive to work in this cesspool of humanity again. No slow fade out or prologue delivered and that's the perfect conclusion to this bleak tale. It's not the ending we wanted but it's the ending we deserve.